New York City is filled with amazing art so why go any further? Because there are some spectacular museums with extraordinary collections set in nearby locales that demand attention. Art can be appreciated for the work itself but taken within its context and history, it can be so much more. 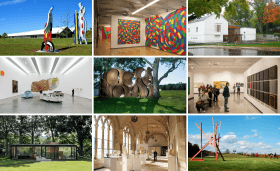 6sqft found a variety of incredibly interesting art destinations in the tri-state area that are worth a trip. Perhaps when planning your next staycation or day-trip, choose one of these museums to set your itinerary.